Outerloop games are one of my favourite up and coming VR developers out there at the moment. They create interesting worlds and understand the strength and limitations of the platform to create some very intuitive controls in interesting genres. 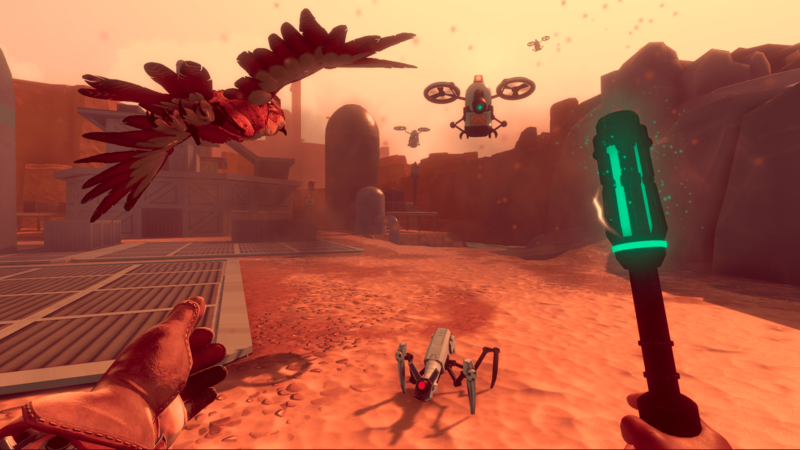 They debuted their first game Wayward Sky at the launch of PSVR in 2016 and followed it up a year later with the criminally underrated RTS Dino Frontier for Sony’s headset. While those games controlled well and had great premises, they did feel a bit short or shallow on the content and variety end. Falcon Age is their latest title and can be experienced both on PS4 and PSVR. Compared to their past forays, Falcon Age features a much meatier experience, making this game feel like more of a full-fledged title with a number of systems at play. The bond and cooperative gameplay offered with your falcon buddy complemented by great controls means that Outerloop has once again taken advantage of VR and motion-controlled gameplay and created something special. While mostly magical, the evolution of Falcon Age’s scope from Outerloop’s other games does present some technical issues. Outerloop Games does a great job of creating interesting worlds and premises and with Falcon Age they double down in this area. Set in a world inspired by the Arizona deserts, the indigenous inhabitants have been colonised by a robotic corporation, and the tyrannical robot overlords force humans to slave, work and mine the resources of the land. It’s a pretty basic setup on paper, but the execution is well done thanks to its simplistic but beautiful art direction, with popping colours that feel like you’re playing a living painting. You play as a young girl named Ara with strong ties to the inhabitants of the land. As you are attempting to escape your prison at the start of the game, you befriend a sweet little falcon who is left alone after her mother is killed in front of your very eyes. This falcon will become your companion and an essential part of the experience going forward as you both attempt to escape and tear down the corporation’s hold on the land. The game’s story won’t rock your socks but it’s serviceable to the actual gameplay in providing context. It’s still a bit short, being on the four-hour side of runtimes, but Falcon Age does offer a lot of systems to make the experience feel richer. The falcon is truly the star of this show. As you adventure through the game, you’ll watch your feathered friend grow, which deepens your bond further with the character. No matter what size the falcon is, you can’t deny how cute it is. Furthermore, taking care of it and using it to solve puzzles and attack enemies allows you to pat, fist bump (google that gif) and do tricks with it. At one point you can even name your falcon. 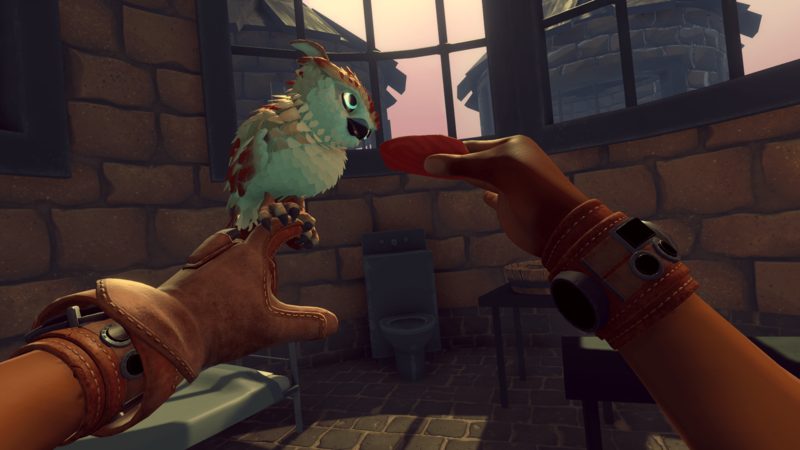 The game even allows you to customise your feathered friend, allowing you to toggle between its young and mature form as well as dress it up with scarves, helmets and even a monocle, for that distinguished falcon look. While there is plenty to do with your buddy outside of gameplay, your falcon is the defining aspect of the moment-moment stuff. 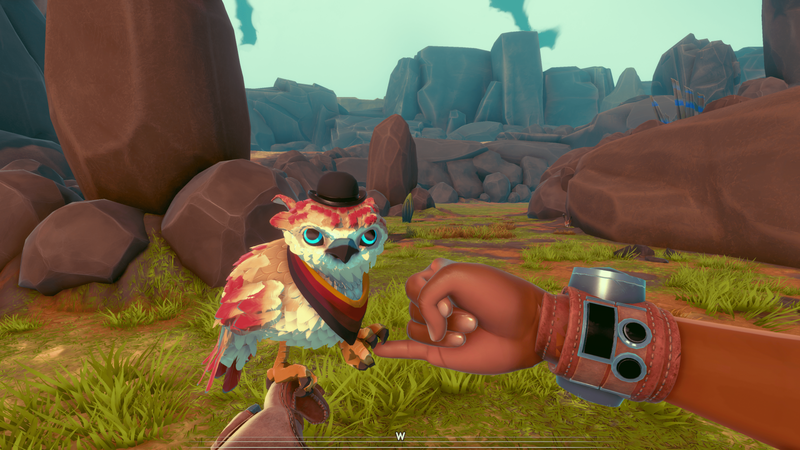 At anytime during gameplay you can whistle in order for your falcon to perch itself on your hand, allowing you to do a multitude of things. Firstly you can point to certain things like wildlife, enemies, hard-to-reach items or ropes for your falcon to swoop at. In some cases the falcon will grab an item in the process, and you can call for it to perch on your arm and give you the item. Conversely, you can also give items to your falcon. From your arm you can also keep your falcon from being fired at in the sky, remove arrows that have been lodged into it or heal it by patting it. There is this cooperative ‘give-and-take’ scenario that really ties into everything. My falcon is great at distracting enemies, but doesn’t have enough attack power to take them down. This is where you come in with your trusty electrified zapper whacking the threat to pieces. Furthermore, while the falcon can hunt, only I can cook them into a meal that the bird can actually consume. As you progress through the game you will find that you will be directing your falcon to do something while you are simultaneously doing something else. Stay away from my falcon! Everything I’ve described above ties into the main shell of the game. Falcon Age functions like a first-person metroidvania. Players are placed in a single map with no loading screens containing linear canyons connecting to other more open areas branching off in different directions. As players unlock new tools and abilities for themselves and their falcons, they will be able to use those abilities to access previously unlockable areas. It’s a tried-and-true formula, but it’s put to good use here. The game offers small survival mechanics that are not too deep or too grindy to get in the way of the actual story, but offer a little variety in between navigation and combat and giving you more opportunity to cooperate and bond with your falcon. Players can either mine resources using their axe (Minecraft style) or use their falcon to hunt animals or extract plants. Players can then go to a cooking station and combine certain foods (using recipe cards you find throughout the game), and cooked food can provide buffs for your falcon, which provides a small but welcome bit of depth to the game. It feels like in its individual gameplay areas it can be a little shallow, but the game is certainly greater than the sum of its parts when the mechanics all gel together. Whether it’s interacting with your falcon, taking down enemies, hunting, cooking, exploring or solving puzzles, you’re always doing something different for long enough so it doesn’t wear thin; things move quickly and I like that. There are also a couple of side games, activities, multiple dialogue options and optional missions that break up the pace nicely. What I did find however, is that the game’s difficulty is a bit too easy. Puzzles can hardly be classified as puzzles and enemies are pretty easy to take down once you know their strategy. It’s strange since the game has one normal difficulty and a difficulty without combat. It would be nice if they had a harder difficulty just to add a bit of a challenge. How can you hate this little cutie? If Outerloop’s games got one thing right in their previous PSVR games, it’s their implementation of the Move controllers. They are simple, relaxing, intuitive and make sense in context of the genre. Falcon Age continues this trend with very clever and easy-to-remember inputs for PS Move controllers. The game also supports DualShock 4 controllers with traditional FPS controls, but I found that a lot less immersive than playing with the Move controllers. The left Move controllers controls most of the Falcon commands. Holding your move horizontally in front of your face will whistle for the falcon and have it perch on you. From here, you can use the right move control to pat it, pick off arrows, feed it or retrieve items from it. You press the move button on the left controller to direct your falcon to swoop at something. The right Move controller does everything else. You can reach for your inventory or your weapon from your hips and use them accordingly. In terms of weaponry the whip is incredibly fun, requiring a flick of the wrist to extend the whip and flicking back in to pull it back. The game also supports full locomotion movement requiring players to press the move button on the right controller to move forward. The bottom two face buttons allow you to turn left or right, which comfort-wise works wonders. However, Falcon Age is one of the first games in a long time to make me feel queasy with smooth turning. I tried this option on both the DualShock 4 and the Moves and still felt the same. This was weird since I am able to play Borderlands 2 VR, Resident Evil 7: Biohazard and Skyrim VR fine with these settings. I am happy to report full locomotion with snap turning works fine with no issues. While pretty in most areas, there are some blemishes throughout the environment and characters that take you out of the experience a bit, and textures also seem to load when you’re about a metre away from them. What was interesting was the fact that instead of just fading in like most foliage textures, the grass grows in front of you as you approach it. It looks weird, but I kind of like it. 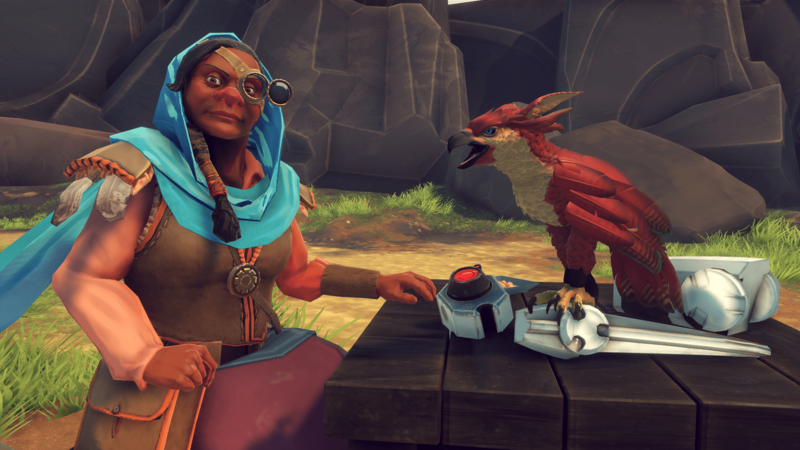 Aside from the visuals, Falcon Age is a little rough around the edges from a technical standpoint also. This could be the fact that the game might be too ambitious for the tiny developer, but it still makes the overall experience feel a bit cheap. Frame drops were particularly egregious, and there were some action-heavy moments where everything that was happening would just chug. There was actually one instance where I had to turn off my PS4, because everything just froze in front of me with some weird distorted visual glitching that prevented me from proceeding. Given that it’s a medium where players are susceptible to motion sickness, perhaps keeping the sudden visual distortions to a minimum should have been a priority. Falcon Age is a special game. It’s one of the few new IPs built from the ground up for PSVR that has multiple gameplay systems in a nice little package and feels like a full experience. Outerloop games have created a memorable world and mixed it in with a clever yet satisfying hook and intuitive controls. It is a tiny bit shallow and it could be a bit more polished in the presentation and technical department, but with a few patches the smooth turning and framerate issue should be eliminated. Outerloops has possibly become one of my favourite VR developers and I’m even more excited for what they do next if this steady upward trend in quality release after release continues.